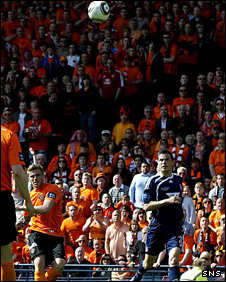 Three second-half goals saw a dominant Dundee United win the Scottish Cup with a convincing victory over Ross County. United shaded a low-key first half against their First Division opponents but struggled to pressurise Michael McGovern in the County goal. David Goodwillie broke the deadlock with a stunning lob after McGovern rushed from his box to head clear. And Craig Conway's late double saw United secure the cup for the second time in their history. It was a nervous opening 10 minutes from both sides in the 125th Scottish Cup, as they struggled to establish any rhythm on the sun-kissed Hampden pitch. United voiced half-hearted penalty appeals when Danny Swanson tumbled under Alex Keddie's challenge but referee Dougie McDonald was unimpressed. 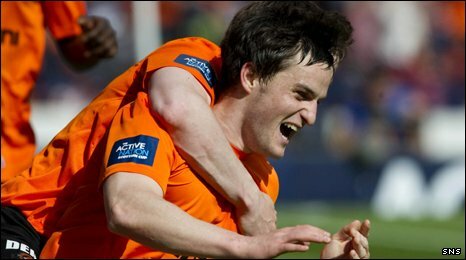 Gary Miller was the first name in the referee's book after 22 minutes for scything down Dundee United striker Goodwillie. But United failed to profit from a promising set-piece as Garry Kenneth headed well over the bar from Conway's accurate centre. County, who accounted for Scottish Premier League sides Hibernian and Celtic en route to the final, were determined not to allow United to get into their stride, as the First Division outfit hunted Tangerine jerseys in hungry packs. United came agonisingly close to breaking the deadlock 10 minutes before the break. Goodwillie played a clever one-two with Swanson and the latter bore down on goal after tearing through the Ross County midfield. But the back-tracking Keddie made a goal-saving challenge on the scampering United midfielder and the danger was cleared. Conway found himself free down the left-hand side moments later and his cross found Prince Buaben, but his header lacked power to trouble County keeper McGovern. And United spurned a great chance to take the lead seconds before half-time when Goodwillie dithered in the box before the impressive Keddie nipped the ball away for a corner. It was one-way traffic towards the County goal and Jon Daly sent a header straight at McGovern in the last chance of the half. The second half began in similar fashion to the first: with United pinning their conservative opponents in their own half for long spells without seriously testing McGovern. United midfielder Morgaro Gomis sent in a deep cross and the stretching Swanson could not get his header on target. Goodwillie broke the deadlock with a stunning lob from just outside the penalty area after County keeper McGovern raced from his line to head clear. Falling behind stung County into action and Jimmy Scott forced Dusan Pernis into his first save of the game in the 68th minute as Derek Adams's side searched for an equaliser. But Conway added a second when he collected Goodwillie's headed flick and sped away from the County defence before sliding a left-foot shot under the on-rushing McGovern. United's second goal seemed to knock the stuffing out of County, who in truth had been a shadow of the side who knocked out Celtic and Hibs in a memorable cup run. Conway grabbed his second and United's third when he controlled Gomis's accurate flick and arrowed a shot into the bottom corner beyond the helpless McGovern. Peter Houston's side saw out the rest of the game comfortably as the United fans celebrated only their second Scottish Cup final victory, while the subdued County followers were left to ponder what could have been. 90:00+2:17 The referee brings the game to a close. 90:00+2:00 The ball is sent over by Gary Miller, clearance made by Andy Webster. 90:00+0:17 Paul Lawson gives away a free kick for an unfair challenge on Morgaro Gomis. Keith Watson restarts play with the free kick. Shot from 12 yards by Craig Conway. Save by Michael McGovern. Morgaro Gomis fouled by Paul Lawson, the ref awards a free kick. Free kick taken by David Robertson. 89:14 Scott Morrison delivers the ball, Dusan Pernis makes a comfortable save. 88:24 Free kick awarded for an unfair challenge on Gary Miller by Jon Daly. Michael McGovern takes the direct free kick. 86:54 Dusan Pernis takes the direct free kick. 86:54 Booking Booking for Garry Wood. 86:51 Foul by Garry Wood on Andy Webster, free kick awarded. 86:16 Paul Di Giacomo takes a shot. Save by Dusan Pernis. 85:08 Assist on the goal came from Morgaro Gomis. 85:08 GOAL - Craig Conway:Dundee Utd 3 - 0 Ross County Craig Conway gets on the score sheet with a goal from inside the box to the bottom left corner of the goal. Dundee Utd 3-0 Ross County. 83:25 The referee blows for offside. Michael McGovern takes the free kick. 82:48 Substitution Keith Watson replaces Mihael Kovacevic. 82:32 Paul Lawson delivers the ball. 82:12 The ball is swung over by Scott Morrison, clearance by Andy Webster. 81:46 Effort on goal by Garry Wood from 12 yards. Dusan Pernis makes a save. 80:16 Free kick awarded for an unfair challenge on David Robertson by Scott Morrison. Andy Webster restarts play with the free kick. 78:58 Substitution Garry Wood joins the action as a substitute, replacing Martin Scott. 77:37 Garry Kenneth takes the direct free kick. 77:37 Substitution David Robertson comes on in place of David Goodwillie. 77:37 Andrew Barrowman concedes a free kick for a foul on Andy Webster. 75:53 Garry Kenneth takes the free kick. 75:53 Substitution Michael Gardyne leaves the field to be replaced by Paul Di Giacomo. 75:53 Iain Vigurs produces a cross, Andy Webster manages to make a clearance. Corner taken by Richard Brittain played to the near post, Morgaro Gomis makes a clearance. Gary Miller gives away a free kick for an unfair challenge on David Goodwillie. 74:36 David Goodwillie provided the assist for the goal. 74:36 GOAL - Craig Conway:Dundee Utd 2 - 0 Ross County A goal is scored by Craig Conway from inside the box low into the middle of the goal. Dundee Utd 2-0 Ross County. 72:53 The free kick is swung in right-footed by Richard Brittain, Andy Webster manages to make a clearance. 72:53 Substitution Daniel Swanson goes off and Scott Robertson comes on. 72:53 Unfair challenge on Iain Vigurs by Mihael Kovacevic results in a free kick. 71:36 Direct free kick taken by Richard Brittain. 71:36 Booking Booking for Morgaro Gomis. 71:33 Free kick awarded for an unfair challenge on Richard Brittain by Morgaro Gomis. 70:16 Centre by Craig Conway, clearance by Scott Boyd. 68:03 Martin Scott takes a shot. Save by Dusan Pernis. 67:04 Booking Booking for David Goodwillie. 65:11 Corner taken right-footed by Morgaro Gomis from the right by-line, clearance made by Scott Boyd. 64:51 Centre by Garry Kenneth. 63:48 Scott Morrison challenges Daniel Swanson unfairly and gives away a free kick. Free kick crossed by Craig Conway, Alexander Keddie manages to make a clearance. 63:31 The ball is delivered by Jon Daly. 62:36 Outswinging corner taken by Richard Brittain from the right by-line, Header by Alexander Keddie from deep inside the penalty area misses to the left of the target. 62:21 The ball is sent over by Martin Scott, Sean Dillon gets a block in. Correction - 60:53 Booking Caution for David Goodwillie. 60:45 GOAL - David Goodwillie:Dundee Utd 1 - 0 Ross County David Goodwillie finds the back of the net with a goal from a long way out to the top right corner of the goal. Dundee Utd 1-0 Ross County. 59:05 Michael Gardyne crosses the ball. 57:50 Jon Daly is flagged offside by the assistant referee. Alexander Keddie restarts play with the free kick. Martin Scott challenges Garry Kenneth unfairly and gives away a free kick. Free kick taken by Dusan Pernis. 57:30 Scott Morrison produces a cross, Sean Dillon manages to make a clearance. 57:07 Iain Vigurs produces a cross, Garry Kenneth makes a clearance. 54:37 The ball is delivered by Morgaro Gomis, Headed effort from inside the penalty area by Daniel Swanson misses to the right of the target. 53:26 Free kick awarded for a foul by Gary Miller on Craig Conway. Free kick crossed right-footed by Craig Conway from left wing. 51:57 Substitution Paul Lawson is brought on as a substitute for Steven Craig. 50:36 Craig Conway produces a cross. 48:56 Free kick awarded for a foul by Morgaro Gomis on Alexander Keddie. Scott Boyd takes the free kick. 48:08 Inswinging corner taken by Craig Conway, Scott Boyd makes a clearance. 47:27 David Goodwillie is adjudged to have handled the ball. Free kick taken by Scott Morrison. 46:58 Effort on goal by Andy Webster from inside the penalty area goes harmlessly over the bar. 46:20 Mihael Kovacevic produces a cross, Richard Brittain makes a clearance. 45:00+1:37 The players leave the pitch at half time. 45:00+1:01 Free kick awarded for an unfair challenge on Michael Gardyne by Prince Buaben. Direct free kick taken by Michael McGovern. 44:47 The ball is delivered by Craig Conway, Jon Daly takes a shot. Save by Michael McGovern. 44:00 Craig Conway takes the inswinging corner, clearance made by Scott Boyd. 42:45 The ball is crossed by Daniel Swanson, Scott Boyd gets a block in. Inswinging corner taken right-footed by Craig Conway from the left by-line, free kick awarded for a foul by David Goodwillie on Michael McGovern. Direct free kick taken by Michael McGovern. 41:57 Foul by Michael Gardyne on Daniel Swanson, free kick awarded. Direct free kick taken by Daniel Swanson. 40:44 Steven Craig concedes a free kick for a foul on Craig Conway. The free kick is swung in right-footed by Craig Conway, Michael McGovern makes a comfortable save. 38:05 Scott Boyd concedes a free kick for a foul on Craig Conway. Andy Webster takes the direct free kick. The ball is swung over by Craig Conway, Morgaro Gomis takes a shot. Save by Michael McGovern. 37:24 The assistant referee signals for offside against Andrew Barrowman. Andy Webster takes the direct free kick. 36:40 Shot by Prince Buaben from outside the box goes high over the crossbar. 35:45 Steven Craig gives away a free kick for an unfair challenge on Craig Conway. Prince Buaben takes the direct free kick. 34:51 Daniel Swanson takes a shot. Alexander Keddie gets a block in. 32:55 Richard Brittain challenges David Goodwillie unfairly and gives away a free kick. Prince Buaben takes the direct free kick. 30:52 Craig Conway delivers the ball, clearance by Scott Boyd. 30:02 The assistant referee flags for offside against Andrew Barrowman. Garry Kenneth restarts play with the free kick. 28:17 Jon Daly crosses the ball, clearance by Scott Boyd. 26:32 Free kick awarded for an unfair challenge on Martin Scott by Prince Buaben. Iain Vigurs crosses the ball from the free kick left-footed from right channel. 25:35 Morgaro Gomis gives away a free kick for an unfair challenge on Martin Scott. Iain Vigurs crosses the ball from the free kick left-footed from right wing. Correction - 24:49 Iain Vigurs fouled by Morgaro Gomis, the ref awards a free kick. Free kick taken by Scott Morrison. 24:49 Unfair challenge on Iain Vigurs by Morgaro Gomis results in a free kick. Scott Morrison takes the direct free kick. 21:32 The ball is delivered by Craig Conway, Garry Kenneth produces a header from deep inside the six-yard box that clears the crossbar. 21:32 Booking Gary Miller receives a yellow card. 21:25 Unfair challenge on David Goodwillie by Gary Miller results in a free kick. 20:40 Unfair challenge on Jon Daly by Scott Morrison results in a free kick. Craig Conway crosses the ball in from the free kick. 19:14 Gary Miller crosses the ball, clearance by Mihael Kovacevic. 18:25 Daniel Swanson challenges Michael Gardyne unfairly and gives away a free kick. Richard Brittain delivers the ball from the free kick right-footed from left wing. 17:33 Craig Conway gives away a free kick for an unfair challenge on Gary Miller. Michael McGovern takes the free kick. 16:46 The ball is crossed by David Goodwillie, Scott Boyd manages to make a clearance. 15:10 The ball is swung over by Alexander Keddie. 14:32 Free kick awarded for a foul by Morgaro Gomis on Martin Scott. Iain Vigurs takes the free kick. 5:09 Iain Vigurs gives away a free kick for an unfair challenge on Daniel Swanson. Sean Dillon takes the free kick. 3:47 Morgaro Gomis gives away a free kick for an unfair challenge on Scott Morrison. Richard Brittain crosses the ball in from the free kick. 2:29 Garry Kenneth crosses the ball, Alexander Keddie manages to make a clearance. 0:51 The referee blows for offside. Michael McGovern restarts play with the free kick. 0:13 Free kick awarded for an unfair challenge on Mihael Kovacevic by Michael Gardyne. Andy Webster restarts play with the free kick.